March is the season which Taiwan’s Indian azalea comes in full bloom. Along the sides of National Taiwan University’s most famous Royal Palm Boulevard, Indian azalea attracts numerous watchers flocking for flower viewing. NTU also holds “Azalea Festival” at the same time, which has already become a major annual event. I think that it would be a pretty good idea to take tours with Street View, but Taipei’s Google Street View is still under construction. At the fastest, the website will take several months to be established. I can’t wait until then, so I think to myself, “Why don’t I set up one?” I’ve just learned some 360 degree panoramic photography techniques recently from a fellow blogger, walker, so I decide to experiment with scenes of NTU’s Royal Palm Boulevard. I’ve spent a few days shooting photos of nearly 150 spots. Since I lack professional panoramic photography tripod head, I can only take pictures manually. I then convert the files to 2:1 panoramic pictures through help of PTGui software. Later I convert them again to kml files with PhotoOverlay software. This kmz file is my finished product. In addition, I’ve created a web version of street view tour guide with Google Earth API. Please click on the following picture. Another window will pop out to carry the street view tour guide. However, the camera icon cannot display, but you can double click to enter another scene when you see words while moving the mouse or when the mouse cursor changes from hand to pointer. I cannot fix this bug. 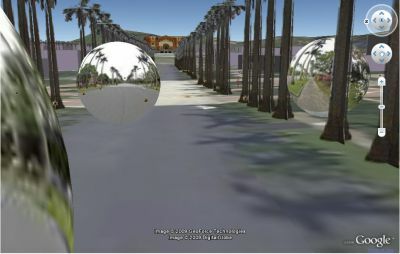 It might be that Google Earth API does not yet support Street View. Google has quietly released an update to the Google Earth Plugin that advances it to GE Version 5 status.Google Earth API now also supports PhotoOverlay, so now the operation of Web Browser will be the same as Google Earth. This entry was posted in GE Application, GE Plugin, NTU Campus and tagged Google Earth Street View Tour. Bookmark the permalink. Helpful info. Lucky me I discovered your site by chance, and I’m stunned why this coincidence did not took place in advance! Thanks so much for giving everyone a very special possiblity to read articles and blog posts from this site. It is usually so useful and packed with amusement for me personally and my office mates to visit your web site really 3 times every week to study the latest secrets you have got. And of course, I’m also at all times fulfilled with all the awesome inspiring ideas you serve. Some 4 tips in this posting are certainly the very best we’ve ever had.